ScaLAPACK is a software package provided by Univ. of Tennessee, Univ. of California, Berkeley, and Univ. of Colorado Denver. PxHSEQR: Nonsymmetric Eigenvalue Problem. Contribution by Robert Granat, Bo Kågström, Meiyue Shao (Umeå University and HPC2N), and Daniel Kressner (École Polytechnique Fédérale de Lausanne). Compute the eigenvalues of a nonsymmetric real matrix. Implement the parallel distributed Hessenberg QR algorithm with the small bulge multi-shift QR algorithm together with aggressive early deflation. See reference  below. PxSYEVR/PxHEEVR: MRRR (Multiple Relatively Robust Representations) algorithm. Contribution by Christof Voemel. Compute the eigenvalues of a symmetric/Hermitian matrix. Implement the parallel distributed MRRR algorithm. See reference  below. BLACS revamping. Contribution by Rodney James (UC Denver). Robert Granat, Bo Kågström, and Daniel Kressner. A Novel Parallel QR Algorithm for Hybrid Distributed Memory HPC Systems. SIAM J. Sci. Comput. 32(4):2345-2378, 2010. Christof Voemel. ScaLAPACK’s MRRR Algorithm. ACM Transactions on Mathematical Software, 37(1):1-35, 2010. Thanks for bug-report/patches/suggestions to: Yana Gurieva (Intel MKL), dstrubbe, Jill Reese (MathWorks), François Thomas, Sebastian Tschiatschek and Joost VandeVondele. Compute the eigenvalues of a nonsymmetric real matrix. Implement the parallel distributed Hessenberg QR algorithm with the small bulge multi-shift QR algorithm together with aggressive early deflation. PxHSEQR computes the eigenvalues of an upper Hessenberg matrix H and, optionally, the matrices T and Z from the Schur decomposition H = Z*T*ZT, where T is an upper quasi-triangular matrix (the Schur form), and Z is the orthogonal matrix of Schur vectors. Optionally Z may be postmultiplied into an input orthogonal matrix Q so that this routine can give the Schur factorization of a matrix A which has been reduced to the Hessenberg form H by the orthogonal matrix Q: A = Q*H*QT = (QZ)*T*(QZ)T.
PxGEBAL balances a general real matrix A. This involves, first, permuting A by a similarity transformation to isolate eigenvalues on the diagonal; and second, applying a diagonal similarity transformation to make the rows and columns as close in norm as possible. Both steps are optional. Balancing may reduce the 1-norm of the matrix, and improve the accuracy of the computed eigenvalues and/or eigenvectors. The graph is extracted from reference  and the experiments have been performed by Robert Granat, Bo Kågström, and Daniel Kressner. This is using Intel Xeon quadcore nodes when computing the Schur form of a dense random matrix reduced to Hessenberg form. (a) Execution times for a 4000 x 4000 matrix using 1 or 4 cores of a single node. (b) Execution times for a 16 000 x 16 000 matrix using 100 cores of 25 nodes. This parallel algorithm is derived from Parlett and Dhillon’s SIAG-LA prize-winning work on sequential MRRR. 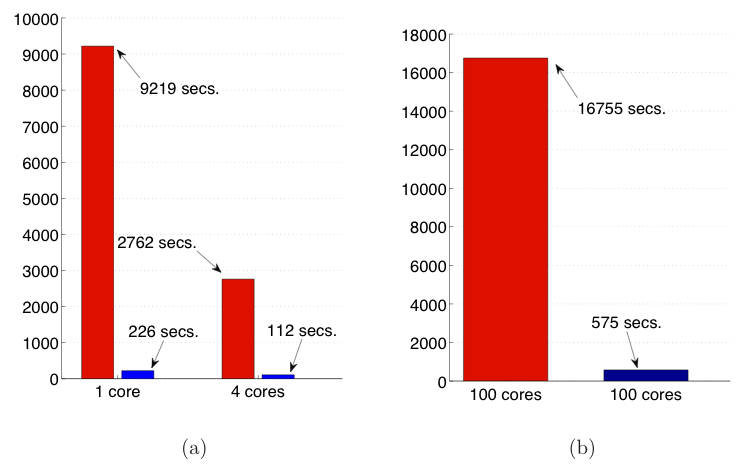 Compared to other algorithms, parallel MRRR has some striking advantages. First, for an n x n matrix on p processors, a tridiagonal inverse iteration can require up to O(n3) operations and O(n2) memory on a single processor to guarantee the correctness of the computed eigenpairs. MRRR is guaranteed to produce the right answer with O(n2/p) memory, and it does not need reorthogonalization. Second, MRRR allows the computation of subsets at reduced cost, whereas QR and Divide & Conquer do not. 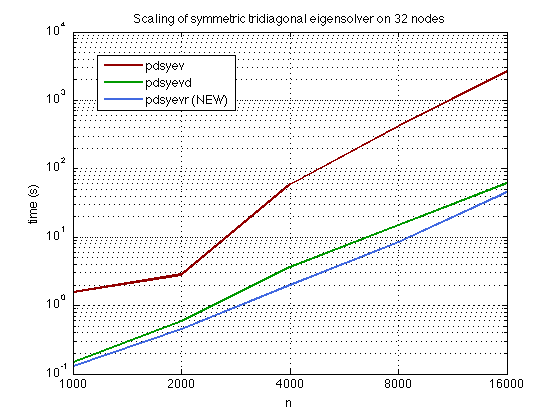 For computing k eigenpairs, the tridiagonal parallel MRRR requires O(nk/p) operations per processor. With ScaLAPACK 2.0, the (MPI) BLACS is now completely integrated into ScaLAPACK. Linking a ScaLAPACK application now only requires linking with libscalapack.a, liblapack.a, libblas.a, and possibly the MPI libraries.